Ketoconazole is an antifungal medication used to treat a number of fungal infections. Applied to the skin it is used for fungal skin infections such as tinea, cutaneous candidiasis, pityriasis versicolor, dandruff, and seborrhoeic dermatitis. Taken by mouth it is a less preferred option and only recommended for severe infections when other agents cannot be used. Other uses include excessive hair growth and Cushing’s syndrome. Common side effects when applied to the skin include redness. Common side effects when taken by mouth include nausea, headache, and liver problems. Liver problems may result in death or the need for a liver transplantation. Other severe side effect when taken by mouth include QT prolongation, adrenocortical insufficiency, and anaphylaxis. It is an imidazole and works by affecting the production of ergosterol required for the fugal cell membrane thereby slowing growth. Ketoconazole was patented in 1977 and came into medical use in 1981. It is avaliable as a generic medication and formulations that are applied to the skin are over the counter. A 30 gram tube in the United Kingdom costs the NHS less than 5 £ as of 2019. In the United States the wholesale cost of this amount is about 6.30 USD. In 2016 it was the 205th most prescribed medication in the United States with more than 2 million prescriptions. The formulation that is taken by mouth was discontinued in Australia in 2013 and in China in 2015. Topically administered ketoconazole is usually prescribed for fungal infections of the skin and mucous membranes, such as athlete's foot, ringworm, candidiasis (yeast infection or thrush), jock itch, and tinea versicolor. Topical ketoconazole is also used as a treatment for dandruff (seborrheic dermatitis of the scalp) and for seborrheic dermatitis on other areas of the body, perhaps acting in these conditions by suppressing levels of the fungus Malassezia furfur on the skin. Ketoconazole has activity against many kinds of fungi that may cause human disease, such as Candida, Histoplasma, Coccidioides, and Blastomyces (although it is not active against Aspergillus), chromomycosis and paracoccidioidomycosis. First made in 1977, ketoconazole was the first orally-active azole antifungal medication. However, ketoconazole has largely been replaced as a first-line systemic antifungal medication by other azole antifungal agents, such as itraconazole, because of ketoconazole's greater toxicity, poorer absorption, and more limited spectrum of activity. Limited clinical studies suggest ketoconazole shampoo used either alone or in combination with other treatments may be useful in reducing hair loss. The side effects of ketoconazole are sometimes harnessed in the treatment of non-fungal conditions. While ketoconazole blocks the synthesis of the sterol ergosterol in fungi, in humans, at high dosages (>800 mg/day), it potently inhibits the activity of several enzymes necessary for the conversion of cholesterol to steroid hormones such as testosterone and cortisol. Specifically, ketoconazole has been shown to inhibit cholesterol side-chain cleavage enzyme, which converts cholesterol to pregnenolone, 17α-hydroxylase and 17,20-lyase, which convert pregnenolone into androgens, and 11β-hydoxylase, which converts 11-deoxycortisol to cortisol. All of these enzymes are mitochondrial cytochrome p450 enzymes. Based on these antiandrogen and antiglucocorticoid effects, ketoconazole has been used with some success as a second-line treatment for certain forms of advanced prostate cancer and for the suppression of glucocorticoid synthesis in the treatment of Cushing's syndrome. However, in the treatment of prostate cancer, concomitant glucocorticoid administration is needed to prevent adrenal insufficiency. Ketoconazole has additionally been used, in lower dosages, to treat hirsutism and, in combination with a GnRH analogue, male-limited precocious puberty. In any case, the risk of hepatotoxicity with ketoconazole limits its use in all of these indications, especially in those that are benign such as hirsutism. Vomiting, diarrhea, nausea, constipation, abdominal pain, abdominal pain upper, dry mouth, dysgeusia, dyspepsia, flatulence, tongue discoloration may occur. The drug may cause adrenal insufficiency so the level of the adrenocortical hormones should be monitored while taking it. On July 2013, the U.S. Food and Drug Administration (FDA) issued a warning that taking ketoconazole by mouth can cause severe liver injuries and adrenal gland problems: adrenal insufficiency and worsening of other related to the gland conditions. It recommends oral tablets should not be a first-line treatment for any fungal infection. It should be used for the treatment of certain fungal infections, known as endemic mycoses, only when alternative antifungal therapies are not available or tolerated. As contraindication it should not be used in people with acute or chronic liver disease. Anaphylaxis after the first dose may occur. Other cases of hypersensitivity include urticaria. The topical formulations have not been associated with liver damage, adrenal problems, or drug interactions. These formulations include creams, shampoos, foams, and gels applied to the skin, unlike the Nizoral tablets, which are taken by mouth. Ketoconazole is likely miscategorized as pregnancy category C drug in the US. Research has shown it to cause teratogenesis when administered in high doses. Recently, the administration of systemic ketoconazole to two pregnant women for treatment of Cushing's syndrome was reported to have no adverse effects,[non-primary source needed] but this small sample precludes drawing any meaningful conclusions. A subsequent trial in Europe failed to show a risk to infants of mothers receiving ketoconazole. Ritonavir is known for increasing activity of the ketoconazole so it is recommended to reduce dosage. There is also list of drugs which significantly decrease systemic exposure to the ketoconazole and drugs whose systemic exposure is increased by the ketoconazole. As an antiandrogen, ketoconazole operates through at least two mechanisms of action. First, and most notably, high oral doses of ketoconazole (e.g. 400 mg three times per day) block both testicular and adrenal androgen biosynthesis, leading to a reduction in circulating testosterone levels. It produces this effect through inhibition of 17α-hydroxylase and 17,20-lyase, which are involved in the synthesis and degradation of steroids, including the precursors of testosterone. Due to its efficacy at reducing systemic androgen levels, ketoconazole has been used with some success as a treatment for androgen-dependent prostate cancer. Second, ketoconazole is an androgen receptor antagonist, competing with androgens such as testosterone and dihydrotestosterone (DHT) for binding to the androgen receptor. This effect is thought to be quite weak however, even with high oral doses of ketoconazole. Ketoconazole is a racemic mixture consisting of cis-(2S,4R)-(−) and cis-(2R,4S)-(+) enantiomers. The cis-(2S,4R) isomer was more potent in inhibiting progesterone 17α,20-lyase than its enantiomer (IC50 values of 0.05 and 2.38 μM, respectively) and in inhibiting 11β-hydroxylase (IC50 values of 0.152 and 0.608 μM, respectively). Both isomers were relatively weak inhibitors of human placental aromatase. When administered orally, ketoconazole is best absorbed at highly acidic levels, so antacids or other causes of decreased stomach acid levels will lower the drug's absorption. Absorption can be increased by taking it with an acidic beverage, such as cola. Ketoconazole is very lipophilic and tends to accumulate in fatty tissues. Ketoconazole is a synthetic imidazole. It is a nonsteroidal compound. It is a racemic mixture of two enantiomers, levoketoconazole ((2S,4R)-(−)-ketoconazole) and dextroketoconazole ((2R,4S)-(+)-ketoconazole). Levoketoconazole is under development for potential clinical use as a steroidogenesis inhibitor with better tolerability and less toxicity than ketoconazole. Other steroidogenesis inhibitors besides ketoconazole and levoketoconazole include the nonsteroidal compound aminoglutethimide and the steroidal compound abiraterone acetate. Ketoconazole was discovered in 1976 at Janssen Pharmaceutica. It was initially introduced in 1977, followed by introduction in the United States in 1981. It was introduced as the prototypical drug of the imidazole antifungals. Oral ketoconazole has been replaced with oral itraconazole for many mycoses. In 2013 the European Medicines Agency's Committee on Medicinal Products for Human Use (CHMP) recommended that a ban be imposed on the use of oral ketoconazole for systemic use in humans throughout the European Union, after concluding that the risk of serious liver injury from systemic ketoconazole outweighs its benefits. ^ "Ketoconazole". Dictionary.com Unabridged. Random House. ^ a b Larry E. Millikan (19 April 2016). Drug Therapy in Dermatology. CRC Press. pp. 82–. ISBN 978-0-203-90831-0. ^ a b c "Assessment report: Ketoconazole HRA" (PDF). www.ema.europa.eu. European Medicines Agency. Committee for Medicinal Products for Human Use. Archived (PDF) from the original on 27 August 2016. Retrieved 26 August 2016. ^ a b Arakaki R, Welles B (February 2010). "Ketoconazole enantiomer for the treatment of diabetes mellitus". Expert Opinion on Investigational Drugs. 19 (2): 185–94. doi:10.1517/13543780903381411. PMID 20047506. ^ a b c d e f g h "Ketoconazole Monograph for Professionals". Drugs.com. American Society of Health-System Pharmacists. Retrieved 23 March 2019. ^ a b c d British national formulary : BNF 76 (76 ed.). Pharmaceutical Press. 2018. p. 1198. ISBN 9780857113382. ^ a b c d e f g h "FDA limits usage of Nizoral (ketoconazole) oral tablets due to potentially fatal liver injury and risk of drug interactions and adrenal gland problems". FDA Drug Safety Communication. U.S. Food and Drug Administration. July 26, 2013. Archived from the original on December 2, 2013. Retrieved November 23, 2013. ^ Fischer, Jnos; Ganellin, C. Robin (2006). Analogue-based Drug Discovery. John Wiley & Sons. p. 503. ISBN 9783527607495. ^ "Oral ketoconazole (Nizoral) 200 mg tablets". Therapeutic Goods Administration (TGA). 10 October 2013. Retrieved 23 March 2019. ^ "国家食品药品监督管理总局关于停止生产销售使用酮康唑口服制剂的公告（2015年第85号）" (in Chinese). China Food and Drug Administration. 2015-06-25. Archived from the original on 2015-07-02. Retrieved 2015-07-02. ^ a b c Phillips RM, Rosen T (2013). "Topical Antifungal Agents". In Wolverton SE (ed.). Comprehensive Dermatologic Therapy (3rd ed.). Philadelphia: Saunders. pp. 460–472. ISBN 978-1-4377-2003-7. ^ Neider R, Fritsch PO (2012). "Other Eczematous Eruptions". In Bolognia JL (ed.). Dermatology (3rd ed.). Philadelphia: Saunders. pp. 219–221. ISBN 9780723435716. ^ Young BK, Brodell RT, Cooper KD (2013). "Therapeutic Shampoos". In Wolverton SE (ed.). Comprehensive Dermatologic Therapy (3rd ed.). Philadelphia: Saunders. pp. 562–569. ISBN 978-1-4377-2003-7. ^ a b c d Finkel R, Cubeddu LX, Clark MA (2009). Pharmacology (4th ed.). Baltimore: Lippincott Williams & Wilkins. p. 411. ^ Kauffman CA (2004). "Introduction to the Mycoses". In Goldman L; Ausiello, D (eds.). Cecil Textbook of Medicine (22nd ed.). Philadelphia: Saunders. p. 2043. ISBN 978-0-7216-9652-2. ^ a b c d e f g h i Kenneth L. Becker (2001). Principles and Practice of Endocrinology and Metabolism. Lippincott Williams & Wilkins. pp. 1197–. ISBN 978-0-7817-1750-2. ^ McElwee KJ, Shapiro JS (June 2012). "Promising therapies for treating and/or preventing androgenic alopecia". Skin Therapy Letter. 17 (6): 1–4. PMID 22735503. Archived from the original on 2015-12-12. ^ Piérard-Franchimont C, De Doncker P, Cauwenbergh G, Piérard GE (1998). "Ketoconazole shampoo: effect of long-term use in androgenic alopecia". Dermatology. 196 (4): 474–7. doi:10.1159/000017954. PMID 9669136. ^ Piérard-Franchimont C, Goffin V, Henry F, Uhoda I, Braham C, Piérard GE (October 2002). "Nudging hair shedding by antidandruff shampoos. A comparison of 1% ketoconazole, 1% piroctone olamine and 1% zinc pyrithione formulations". International Journal of Cosmetic Science. 24 (5): 249–56. doi:10.1046/j.1467-2494.2002.00145.x. PMID 18498517. ^ Khandpur S, Suman M, Reddy BS (August 2002). "Comparative efficacy of various treatment regimens for androgenetic alopecia in men". The Journal of Dermatology. 29 (8): 489–98. doi:10.1111/j.1346-8138.2002.tb00314.x. PMID 12227482. ^ Evans, K. C.; Peterson, A. C.; Ruiz, H. E.; Costabile, R. A. (2004-08-01). "Use of oral ketoconazole to prevent postoperative erections following penile surgery". International Journal of Impotence Research. 16 (4): 346–349. doi:10.1038/sj.ijir.3901160. ISSN 0955-9930. PMID 14973533. ^ "MedScape". Ectopic Cortisol Production Derived From Malignant Testicular Masses: Treatment and Management. Nature Publishing Group. Archived from the original on 13 May 2018. Retrieved 18 April 2015. ^ a b Loose DS, Kan PB, Hirst MA, Marcus RA, Feldman D (May 1983). "Ketoconazole blocks adrenal steroidogenesis by inhibiting cytochrome P450-dependent enzymes". The Journal of Clinical Investigation. 71 (5): 1495–9. doi:10.1172/JCI110903. PMC 437014. PMID 6304148. ^ Zelefsky MJ, Eastham JA, Sartor OA, Kantoff P (2008). DeVita VT, Lawrence TS, Rosenberg SA (eds.). Cancer: Principles & Practice of Oncology (8th ed.). Philadelphia: Lippincott Williams & Wilkins. p. 1443. ISBN 9780781772075. ^ Loli P, Berselli ME, Tagliaferri M (December 1986). "Use of ketoconazole in the treatment of Cushing's syndrome". The Journal of Clinical Endocrinology and Metabolism. 63 (6): 1365–71. doi:10.1210/jcem-63-6-1365. PMID 3023421. ^ Thompson IM (2001). "Flare Associated with LHRH-Agonist Therapy". Rev Urol. 3 Suppl 3: S10–4. PMC 1476081. PMID 16986003. ^ Allen JM, Kerle DJ, Ware H, Doble A, Williams G, Bloom SR (December 1983). "Combined treatment with ketoconazole and luteinising hormone releasing hormone analogue: a novel approach to resistant progressive prostatic cancer". Br Med J (Clin Res Ed). 287 (6407): 1766. doi:10.1136/bmj.287.6407.1766. PMC 1549867. PMID 6315133. ^ a b c d e "Nizoral (Ketoconazole): Side Effects, Interactions, Warning, Dosage & Uses". RxList. Retrieved 2019-04-07. ^ a b c d e "JANSSEN PHARMACEUTICALS NIZORAL(KETOCONAZOLE) TABLETS" (PDF). ^ Amado JA, Pesquera C, Gonzalez EM, Otero M, Freijanes J, Alvarez A (March 1990). "Successful treatment with ketoconazole of Cushing's syndrome in pregnancy". Postgraduate Medical Journal. 66 (773): 221–3. doi:10.1136/pgmj.66.773.221. PMC 2429473. PMID 2362890. ^ Berwaerts J, Verhelst J, Mahler C, Abs R (June 1999). "Cushing's syndrome in pregnancy treated by ketoconazole: case report and review of the literature". Gynecological Endocrinology. 13 (3): 175–82. doi:10.3109/09513599909167552. PMID 10451809. ^ Kazy Z, Puhó E, Czeizel AE (March 2005). "Population-based case-control study of oral ketoconazole treatment for birth outcomes". Congenital Anomalies. 45 (1): 5–8. doi:10.1111/j.1741-4520.2005.00053.x. PMID 15737124. ^ Cartledge JD, Midgley J, Gazzard BG (December 1997). "Clinically significant azole cross-resistance in Candida isolates from HIV-positive patients with oral candidosis". AIDS. 11 (15): 1839–44. doi:10.1097/00002030-199715000-00008. PMID 9412702. ^ Sanglard D, Ischer F, Monod M, Bille J (February 1997). "Cloning of Candida albicans genes conferring resistance to azole antifungal agents: characterization of CDR2, a new multidrug ABC transporter gene". Microbiology. 143 ( Pt 2) (Pt 2): 405–16. doi:10.1099/00221287-143-2-405. PMID 9043118. ^ Witjes FJ, Debruyne FM, Fernandez del Moral P, Geboers AD (May 1989). "Ketoconazole high dose in management of hormonally pretreated patients with progressive metastatic prostate cancer. Dutch South-Eastern Urological Cooperative Group". Urology. 33 (5): 411–5. doi:10.1016/0090-4295(89)90037-X. PMID 2652864. ^ De Coster R, Wouters W, Bruynseels J (January 1996). "P450-dependent enzymes as targets for prostate cancer therapy". The Journal of Steroid Biochemistry and Molecular Biology. 56 (1–6 Spec No): 133–43. doi:10.1016/0960-0760(95)00230-8. PMID 8603034. ^ Eil C (August 1992). "Ketoconazole binds to the human androgen receptor". Hormone and Metabolic Research = Hormon- und Stoffwechselforschung = Hormones et Metabolisme. 24 (8): 367–70. doi:10.1055/s-2007-1003337. PMID 1526623. ^ Loose DS, Stover EP, Feldman D (July 1983). "Ketoconazole binds to glucocorticoid receptors and exhibits glucocorticoid antagonist activity in cultured cells". The Journal of Clinical Investigation. 72 (1): 404–8. doi:10.1172/jci110982. PMC 1129197. PMID 6135709. ^ Duret C, Daujat-Chavanieu M, Pascussi JM, Pichard-Garcia L, Balaguer P, Fabre JM, Vilarem MJ, Maurel P, Gerbal-Chaloin S (July 2006). "Ketoconazole and miconazole are antagonists of the human glucocorticoid receptor: consequences on the expression and function of the constitutive androstane receptor and the pregnane X receptor". Molecular Pharmacology. 70 (1): 329–39. doi:10.1124/mol.105.022046. PMID 16608920. ^ Philippaert, Koenraad; Kerselaers, Sara; Voets, Thomas; Vennekens, Rudi (1 January 2018). "A Thallium-Based Screening Procedure to Identify Molecules That Modulate the Activity of Ca2+-Activated Monovalent Cation-Selective Channels". SLAS Discovery : Advancing Life Sciences R & D. 23 (4): 341–352. doi:10.1177/2472555217748932. PMID 29316407. ^ Chin TW, Loeb M, Fong IW (August 1995). "Effects of an acidic beverage (Coca-Cola) on absorption of ketoconazole". Antimicrobial Agents and Chemotherapy. 39 (8): 1671–5. doi:10.1128/AAC.39.8.1671. PMC 162805. PMID 7486898. ^ a b c d e J. Elks (14 November 2014). The Dictionary of Drugs: Chemical Data: Chemical Data, Structures and Bibliographies. Springer. pp. 720–. ISBN 978-1-4757-2085-3. ^ a b c d e f Index Nominum 2000: International Drug Directory. Taylor & Francis. 2000. pp. 586–. ISBN 978-3-88763-075-1. ^ Heeres J, Backx LJ, Mostmans JH, Van Cutsem J (August 1979). "Antimycotic imidazoles. part 4. Synthesis and antifungal activity of ketoconazole, a new potent orally active broad-spectrum antifungal agent". Journal of Medicinal Chemistry. 22 (8): 1003–5. doi:10.1021/jm00194a023. PMID 490531. ^ a b David E. Golan (2008). Principles of Pharmacology: The Pathophysiologic Basis of Drug Therapy. Lippincott Williams & Wilkins. pp. 624–. ISBN 978-0-7817-8355-2. ^ a b I.K. Morton; Judith M. Hall (6 December 2012). Concise Dictionary of Pharmacological Agents: Properties and Synonyms. Springer Science & Business Media. pp. 159–. ISBN 978-94-011-4439-1. 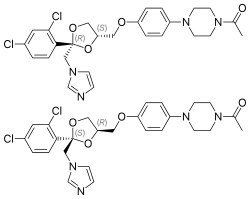 ^ a b c "Ketoconazole". ^ "European Medicines Agency recommends suspension of marketing authorisations for oral ketoconazole". Press Release. European Medicines Agency. 2013-07-26. Archived from the original on 2014-01-14. ^ KuKanich B (January 2008). "A review of selected systemic antifungal drugs for use in dogs and cats". Veterinary Medicine. Archived from the original on 2013-10-05. This page was last edited on 20 April 2019, at 17:32 (UTC).